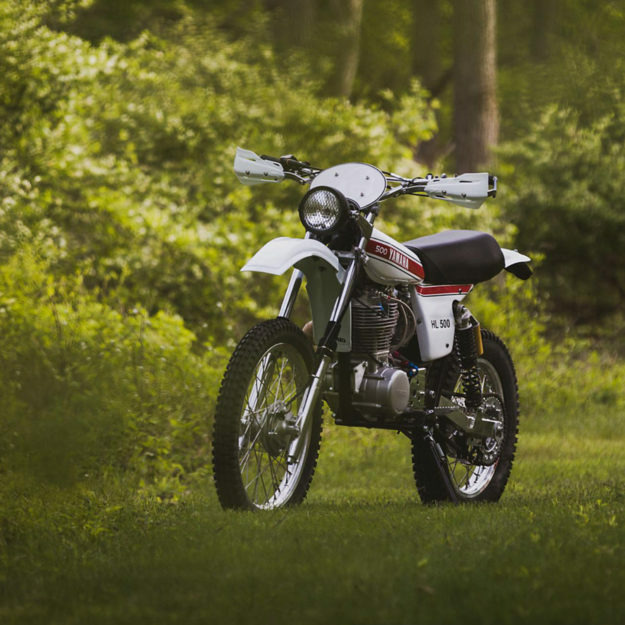 So much so, Husky Restorations have taken up the torch and begun crafting their own reproductions, built to the original Hallman/Lundin spec. The all-important frame used here is built by Illinois-based Framecrafters to match the lightweight prototype’s spec, and the engine has been lightly breathed on. There’s a new cam and a Mikuni carb to deliver some extra oomph, but it’s a true XT500 unit. 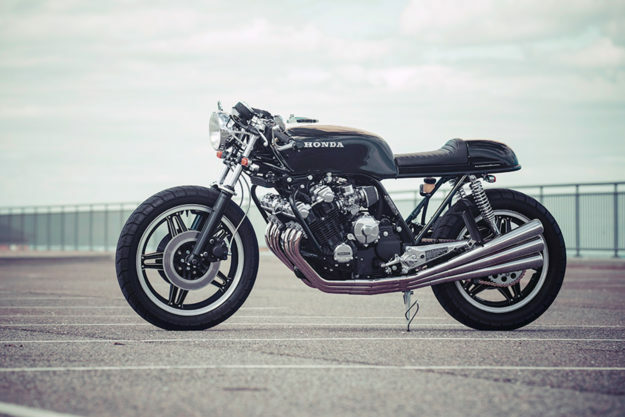 Honda CBX1000 by Motoarchitectura The custom scene in the snowbelt can be a touch fickle. Sure, cold winters offer up plenty of shop time—but the short seasons stop a lot of people from ever riding in the first place. 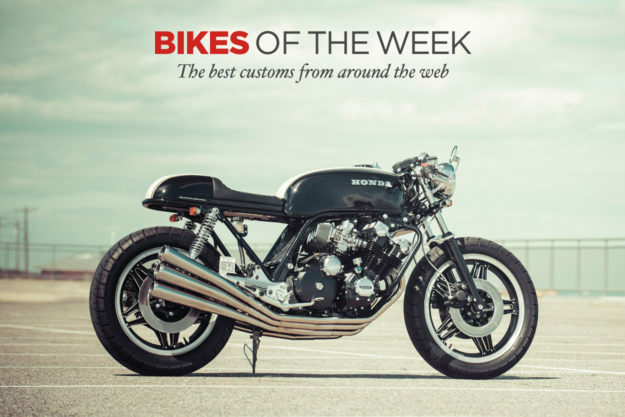 Michael Kopec, head of Long Island, NY based Motoarchitectura, has long embraced the increased shop time and his latest, this CBX1000 cafe racer is nothing short of perfection. Working from a bare frame from an 1982 donor, Michael had to search far and wide for the parts and pieces to make this cafe racer come together. The CBX’s rarity made that tough, but Michael is a bit of an expert with this particular breed: he’s owned, restored and worked on at least five so far. Verve Tracker125i To say the time is ripe for a street-legal, factory tracker to hit showrooms is a bit of an understatement. If we were betting folks here at the EXIF offices, we’d have put our money on Triumph or Ducati to deliver the goods—but we’ve just been proved wrong. Moto Guzzi V9 by Moto Strada It’s a true testament to an OEM’s attention to detail that even subtle custom touches can set a bike off. 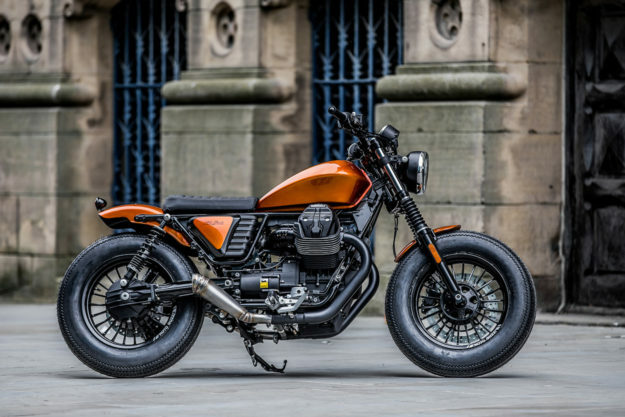 Somewhat quiet since its launch, the Moto Guzzi V9 is a machine begging for this treatment—and the UK dealer Moto Strada Automotive has obliged. While there’s nothing over-ambitious about the work done here—the frame has been left untouched—the added touches are simple, clean and exquisite. The most obvious change is the Candy Copper paintwork that now adorns the tank, fenders and side pods. Set off by the black accents and bespoke detailing, that alone was enough to raise eyebrows when it made its debut at London’s recent Bike Shed Show. 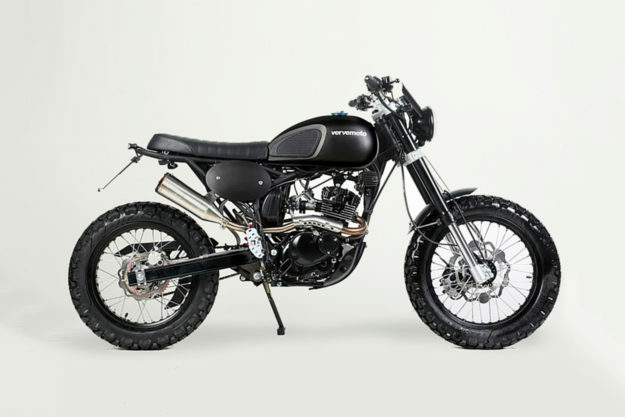 Ducati Scrambler by Grime and Marin Speed Shop Ducati’s Scrambler range is off to a roaring success. The showroom lineup has a bike that will tickle most riders’ fancy, and in the hands of a custom builder, Scramblers have proven to be an even more exquisite success. That lesson has not been lost on the mothership. 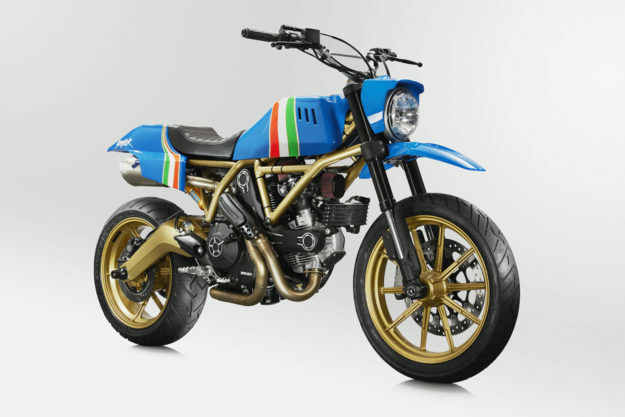 To help foster the spirit already stirring, Ducati has started the ‘Mavericks’ custom project. The first cab off the rank is this 80s-style enduro beast by the American tattoo artist Grime—the ‘Valentino Rossi of tattooing’—and Marin Speed Shop.